Designed to recover deleted file / lost files from all types of media such as Hard Drives, Floppy Drives, SmartMedia, CompactFlash, Memory Sticks, and other types of removable media. 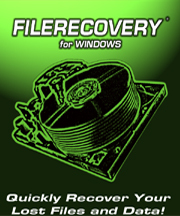 Recover Deleted File for Windows is a safe and affordable do-it-yourself recover deleted files / recover lost files, recover hard drive solution that is designed to recover deleted files from all types of media such as Recover Hard Drives, Floppy Drives, SmartMedia, Compact Flash, Memory Sticks, and other types of removable media. Recover Deleted File for Windows recover deleted files whether they have been deleted from the command line, from within an application, Windows Explorer, or removed from the Recycle Bin or recover lost files of hard driver. 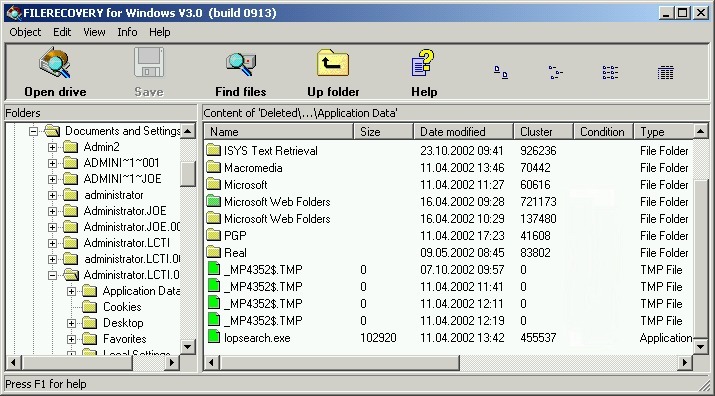 Recover Deleted File for Windows will scan the hard drive and bring up list of files which can be saved from the scanned hard drive. Recover Deleted File for Windows is a non-destructive read-only application and will not write or make changes to the drive it is recovering from. To preserve the hard drive with the deleted files, all recovered files must be saved to another storage device or another drive letter in the system. DO NOT download the software to the drive that you want to recover. If you want to recover deleted files or lost files from your system hard drive, download the software to another system and burn it to a CD*. Then run the software on the affected system from the CD.